Kanchanaburi is one of the most picturesque provinces in Thailand - wild jungles, rugged hills. And for the archaeologically minded it may by of interest to know that a freak accident during World War II led to the discovery of Neolithic burial sites in this area. 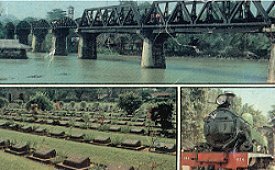 In the Cemetery at Kanchanaburi, British, Dutch, Indian and Australian soldiers, who lost their lives during the construction of the notorious "Death Railway" during World War II, are buried. Tourists as well as state dignitaries come to pay their respects from time to time. 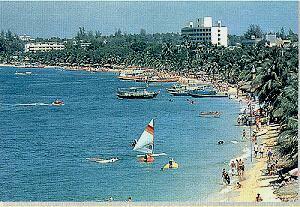 Now a world renowned seaside resort on the eastern shore of the Gulf of Siam. Pattaya Beach has a charm of its own - Exotic Beach hotels and bungalows, authentic seafood restaurants, mile upon mile of dazzling white sand and bright blue sea - Water skiing, scuba diving, sailing, Island excursion, fishing, sunset cruise of just plan rest. Normally a two hour scenic drive from Bangkok but for groups a delightful cruise of 4.5 hours on a pleasure boat can be arranged on a package.